Parents use a variety of social network sites, with Facebook being the most popular. Usage rates for social media are similar to those of non-parents. Fully 91% of parents15 in this survey use the internet. This is significantly higher than rates seen in the general adult population 16 and among those adults who are not parents. Among these internet-using parents, social media use across a variety of platforms is common, with 83% of parents using social media.17 The most popular platform among parents (and non-parents) is Facebook. Almost three-quarters of online parents (74%) use Facebook, a proportion similar to the 70% of non-parents who use the platform. Online mothers are more likely than online fathers to use Facebook – 81% vs. 66%. This reflects broader trends in social media use. While men and women are equally likely to say they use social networking sites18, women are more likely to be users of specific platforms19 like Facebook, Instagram, and Pinterest. Mothers and fathers differ in their use of Instagram and Pinterest. Parents and non-parents are equally embrace Pinterest and Instagram – among parents, 28% use Pinterest and 25% use Instagram. The greatest variation in use of the platforms is between moms and dads. Online mothers are more than twice as likely to use Pinterest than online fathers – some 40% of mothers do so compared with 15% of fathers. This echoes the popularity of Pinterest among online women more generally – they are three times as likely to use Pinterest as online men, 42% vs. 13%. A similar pattern emerges with Instagram. Mothers who use the internet are more likely than fathers to use Instagram, 30% vs. 19%. Again, this tracks with the broader trend that online women are more likely than men to use Instagram, 29% vs. 22%. A quarter (27%) of online parents use LinkedIn, and 23% use Twitter. Again, these levels of use are consistent with the usage of non-parents. 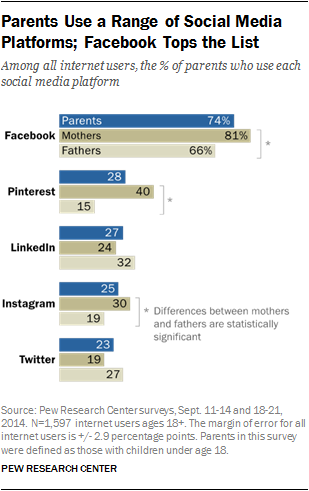 And, with these platforms, there is not a statistical difference in use of Twitter or LinkedIn between moms and dads. There are few demographic differences among parents across platforms. Younger parents (those under 40) are more likely to use Instagram than are older parents, 33% vs. 18%. Parents of younger children also are more likely to be Instagram users. Among online parents who only have children ages 5 or under, 35% use Instagram. This is a significant difference when compared with the 22% of remaining parents with children over age 5 who use Instagram. Parents — particularly moms and younger parents — are active users of Facebook. Facebook is not only the most popular social media site overall, it also has an especially engaged network of parents. Among parents who use Facebook, fully 75% log on daily, including 51% who do so several times a day. This proportion of daily users is significant compared with non-parents, 67% of whom log on daily, including 42% who use Facebook several times a day. Another 12% each of Facebook-using parents log on weekly and less often, respectively. Moms who use Facebook are more likely to check the platform several times a day compared with dads (56% vs. 43%). Younger parents (those under age 40) also are more likely to use Facebook on a daily basis than are parents ages 40 and older. Some 82% of parents under age 40 log on daily, compared with 68% of older parents. Older parents are more likely to log on weekly; 18% use the site weekly vs. 7% of younger parents. Instagram users also tend to log on frequently, although parents use the site less often when compared with non-parents. Some 39% of parents on Instagram use the platform daily, significantly less than the 54% of non-parents who do so. Parents who are LinkedIn users are more likely than non-parents to use the site daily – 19% do so vs. 10% of non-parents. There are no statistically significant differences in how frequently parents and non-parents use Twitter or Pinterest.